Who has Tonneau covers on their Taco? Discussion in 'Tonneau Covers, Caps and Shells' started by gsm, Nov 29, 2007. 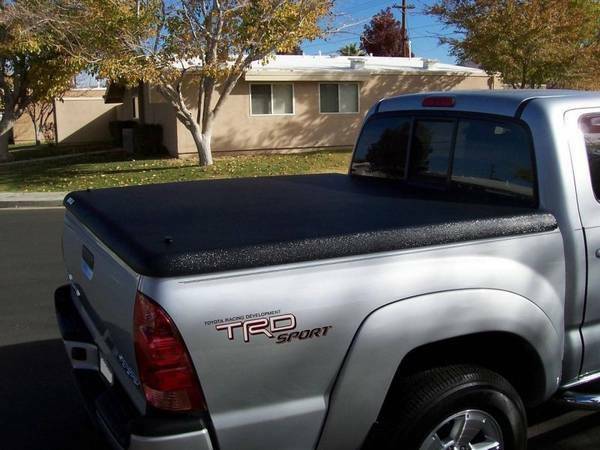 What brand/type of Tonneau Cover are Taco owners using? I'm thinking about getting a Tonneau cover for my Regular Cab. Figure it would help on gas mileage while keeping things dry in the bed. I don't want to interfer with the bed rail tie-downs as I expect to be using them often. My wife ordered me an Access LE tonneau five weeks ago. Unfortunately, the local place she ordered it through is incompetent. It has been a mess, but I should get it today. It moves the bed rails in 1 inch. You have full use of them after that. My boss has the same cover on his Tundra (06) and it is awesome! I have an Advantage Torza Top tri-fold (soft tonneau). It's been great! I love the fact there are no snaps. You can fold it up easily and take the whole thing off (rails & all) easily. It is pricey - but WELL worth it. It doesn't interfere with the rail system. Rear mounting point w/ safety pin. Total of 4 attachement points similar to that. The two in the front don't have the safety pins. I've got an Extang FullTilt on mine. Bed rail tie downs are still fully usable, except for the 4 places where it uses the bed rails to mount to the cover frame. It is a rear hinged type, so that the cover itself is never folded back on itself. This is important, because if you fold the cover 180 degrees back on itself, over time the vinyl will start to crack and fail. My 04 had a tonneau master hinged cover on it, and id only folded about 60 deggrees back on itself, and in three years, it was starting to leak at that point. I can remove the cover, frame and all and leave it in the yard in about 45 seconds. If I am out and need to take it off and roll it up, it takes slightly longer like 2 and a half minutes. I've got this one the Access LE. I'm very pleased. I had a hard fiberglass cover on an older truck (came with it when I bought it) and I hated it. It was a two person job to take it off when I needed to haul something big. With the Access, you remove the existing bed rails, then mount their rails behind them. That's what 007 means by moving the rails 1 inch. Now, when I need to use the full bed to haul something big, I can roll it up in 30 seconds and secure it right behind the cab. I can't quantify any gas savings, but the cover was a lifesaver on our Thanksgiving trip when it was raining on the entire return trip. All of our luggage was dry. ...the cover was a lifesaver on our Thanksgiving trip when it was raining on the entire return trip. All of our luggage was dry. That is what I was supposed to get before Thanksgiving so that we could take my truck to North Carolina. it didn't happen. We took the RAV4. Hahah... I'm about to buy a RAV4 early next year. So we'll have a Taco and a Rav. Just got my Armorlid a couple days ago. So far I love it, its light weight (60#) and is very secure. It is also the least expensive hard cover that I was able to find. Bummer. Normally I hate road trips, but since the Taco is so much fun to drive I enjoyed it. Don't mean to pour salt in an open wound. I'm going in the AM to have the Undercover tonneau put on my truck. Almost all the reviews I've found have been positive, but I know you CAN'T use the tie downs with it (I think the mini tie downs can be used). I've read that the Access LE covers do allow the use of the tie downs. Good luck with your decision! As slow and boring as my wife's CR-V is, I still would spend her kind of gas money than mine. She gets about 6 more miles to the gallon than I do. And her radio plays MP3 cds in the stock format. Does is keep the rain out? Back to the case though. I have the Extang Trifecta, I can take it off in less than two minutes on my own. Connects Directly to the current rail system no modifications necessary. Water tight... I have actually hit it with my hose at full pressure with NO, I repeat no water seepage. The new RAV4s are awesome cars, and they are huge on the inside. We were quite comfortable on the trip in the RAV4 even through REALLY BAD weather. The only problem I had is that we have the Sport model, and it is lower than the Limited and Base models because of its profile tires and tuned suspension. Your cover looks great. They gave me one of the new Extang covers at first, and it flapped around like it was going to take off. Instead of having a tensioner at one end, it had heavy duty springs that didn't work at all. What a bummer - it looked good, and cost less than the Access LE. No worries. I will be driving it to New Orleans in two weeks for the Dec 15th Tacoma Meet in Metarie. That is my question too. How dry does the stuff in your bed stay? I agree with Janster...I have the tri fold too. Mine is a Lund Genesis Tri fold cover and looks much like his. I used to have a roll up and find this MUCHO more convenient! Everything stays completely dry for me as well. I really wanted an undercover, but they are so much more expensive. My boss sold me on the Access cover. His 06 Tundra has an Access LE, and it is awesome. Be sure to take pics of your undercover! I would love to see. I thought the stock decks did play MP3 CDs??? I will look at the one I have sitting in my garage. I think it has the MP3 symbol on it. If it does, would you be interested in it? My wife's RAV4 is a V6 4WD model. Because of the 5 speed automatic, we can get up to 32 MPG. We actually got 34 out of one tank on Thanksgiving, but that was 60 MPH in the fog and after I installed an ECO-2 VPE. Most of the time we average around 25-26 on the highway at 75-80 MPH. I can get that out of my 2.7L Tacoma with little effort and still go 75 MPH. I just wish that tonneau cover had come in on time.